When we first discussed making up a kit for the Cube Socks early in 2018, I was skeptical. I thought they looked like a pretty cool pair of socks, but I was turned off by the fact that they’re worked in intarsia. My previous experiences with this technique were generally successful, but I didn’t enjoy it and wasn’t completely happy with the results. I had used an intarsia-in-the-round method that requires wrapping a stitch on one round and working the wrap together with a stitch on the following round, which created uneven tension and excess bulk. Then the Summer 2018 issue of knitscene arrived on my desk. I immediately flipped through the issue, and when I got to the sidebar describing the intarsia-in-the-round technique used in the Cube Socks, I was so intrigued that I just had to try it! Fortunately, we still had our sample packs of SweetGeorgia Yarns’s Party of Five mini-skein sets, so I selected the Blueberry Cobbler colorway, picked up some needles, and got to work. After working on them for a few weeks, I’m nearly done with the first sock and just have a few more decreases to finish on the toe. 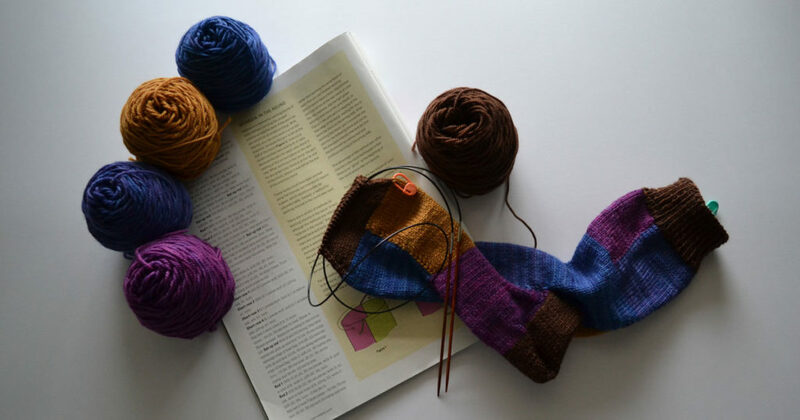 I can honestly say I’m looking forward to starting the second sock—and finishing up the pair so I can wear them. I’m planning to change up one little thing on the second sock, though: since I like my socks to be symmetrical, I’ll switch my D and E colors so that the color blocks will be mirrored. 1. 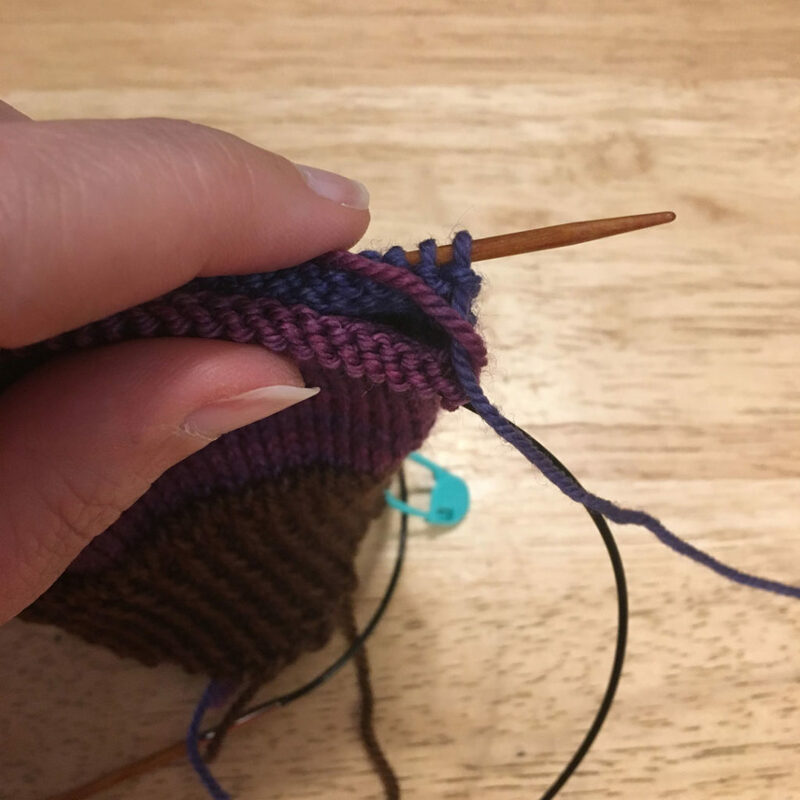 I highly recommend using two circular needles to avoid having to slip stitches on each round. I used 32” circulars, since that’s what I had available, and found them to be a bit too long. You might prefer to use 20”, 24”, or even 16” circulars. Figure 1: After interlocking the strands, give the new working strand a good tug on the first and second stitches of the second half of the round. 2. After you’ve worked across half the stitches in a row and are ready to work with the next color, you need to interlock the strands. To do this, simply lay the strand you’re dropping over the strand you’re about to work with. Be sure to give the new working strand a good tug on the first and second stitches to keep a tight join (see Figure 1). Figure 2: Firmly tug on the working strand before knitting the first stitch of a new round to prevent ladders at the join. 3. 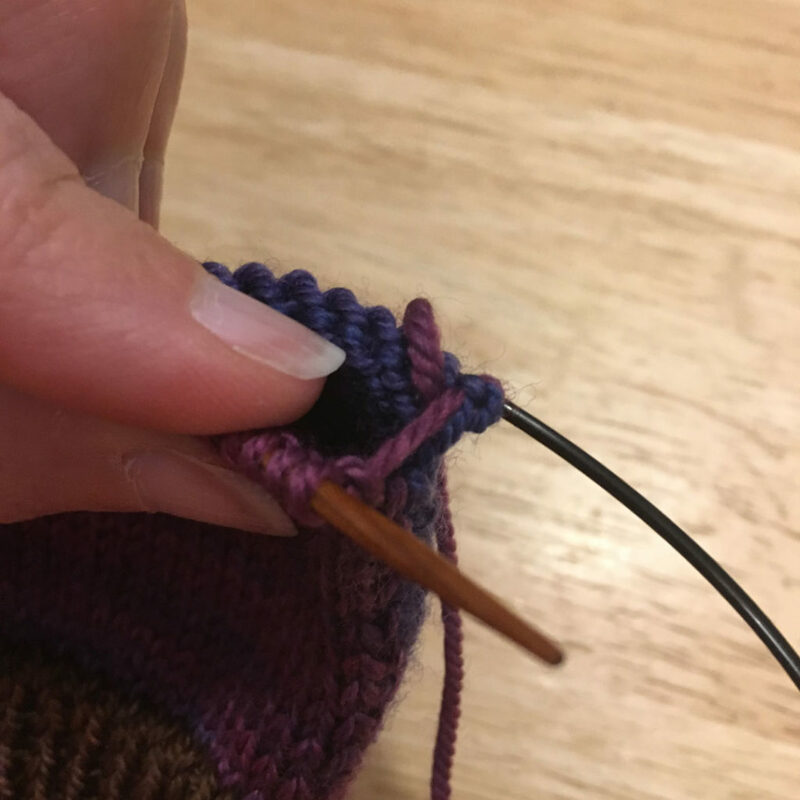 When you’re ready to start a new round, firmly tug on that working strand before working the first stitch to take up the slack. This will help prevent ladders at the join (see Figure 2). Hopefully, I’ll soon have a finished pair of Cube Socks to share with you! Get Started on the Cube Socks!